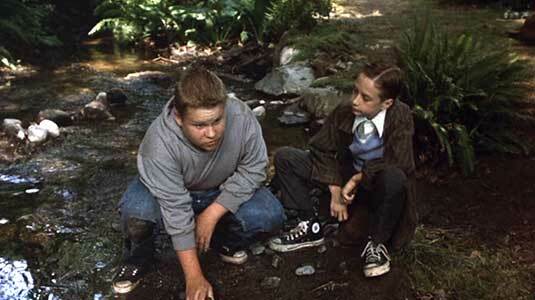 Jonathan Brandis, Brandon Crane, Adam Faraizl, Seth Green, Marlon Taylor, Drum Garrett and others wear black high top and optical white low cut Converse “Chuck Taylor” All Stars in the film. The “Losers Club” bands together to protect themselves against town bullies and the malevolent force of “It”. It is a made for television adaption of Stephen King’s epic-length horror story which was later released on video. The story is set mostly in the small city of Derry, Maine, and divides itself between flashbacks of events that happened in 1960 and the present time, thirty years later. The story focuses on seven principal characters who were all twelve years old when they became aware of a malevolent force in town that starts terrorizing them by preying on their innermost fears and insecurities. The seven, double-cast as adults and kids are: Bill Denbrough (Richard Thomas and Jonathan Brandis), the stuttering but creative social conscience of the group who as an adult became a successful mystery writer; Ben Hanscom (John Ritter and Brandon Crane) an overweight kid with great intelligence and skill as a builder who later overcame his weight problem and became a successful architect; Eddie Kaspbrak (Dennis Christopher and Adam Faraizl) a small kid who suffers from hypochondria and an overly protective mother who as an adult runs a successful limousine service in New York but was never able to escape from his mother; Richie Tozier (Harry Anderson and Seth Green) the nerd-like class clown who became a successful comedian; Beverly Marsh (Annette O’Toole and Emily Perkins), a sweet young girl who suffered first from an overly strict and demanding father and later an abusive boyfriend; Stan Uris (Richard Masur and Ben Heller), a Jewish boy scout, empiricist, and later ornithologist who had the most trouble admitting that the evil force existed; and Mike Hanlon (Tim Reid and Marlon Taylor), a young black historian and photographer who later became the town librarian in Derry. The evil force often attracts the attention of its victims by first appearing as Pennywise the Clown (Tim Curry), and in a couple of early scenes, you see the clown distract then kill two young kids, including the little brother of Bill Denbrough. Ben and Eddie decide to build a dam in the local stream. 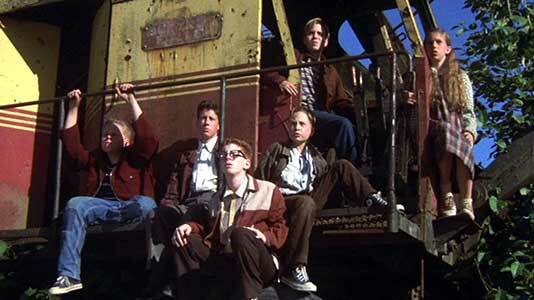 The seven kids, outcasts because of physical traits or low social status (Bill’s stutter, Eddie’s small size and asthma attacks, Richie’s clumsiness and scathing sense of humor, Beverly’s the daughter of the school janitor, Ben’s overweight and is a newcomer in town, Mike’s race, and Stan’s religion) are often the targets of the town bullies led by Henry Bowers(Michael Cole) and his sidekick “Belch” (Drum Garrett). To protect themselves they become a club, dubbed “The Loser’s Club” by Henry and soon discover the power and comfort that their mutual friendship gives them, not only in dealing with the bullies but also in the combatting the effects of the terrorizing hallucinations caused by Pennywise the Clown that they each have experienced. Bill is the first to notice the extra power that they have when they band together and Mike’s research on the history of the town leads them to discover that the appearance of the force seems to occur periodically, every thirty years. Eventually they make a pact to try and kill the evil force by confronting It in it’s lair, which they believe is in the town’s underground sewer plant, and to come back to together if the evil force ever reappears. Bill and Eddie confront town bullies Henry and Belch. The main story line of It, however, comes from the year 1990. Mike, who is the only of the original seven left in Derry, notices that a series of disappearances and murders has started occurring in town, eerily like what they experienced in 1960. Remembering the pact that the seven made in 1960, Mike starts calling each of the other six up, and asks them to return to Derry to deal with the malevolent force again. As each of the seven reflect on what is being asked of them, they experience a flashback to their own personal experiences of terror in the town from both supernatural and human caused events. This long sequence of incidents really catches your attention, builds the suspense, and you see how the adult personalities for each character were shaped by the cathartic events that happened to them in 1960. This also sets up the main premise of the story: the reunion of the seven friends, how they respond to their pledge to each other, and how they deal with the reappearance of the evil “It”. Mike Hanlon runs away from Henry and his gang in hot pursuit. It is one of the best screen adaptions of Stephen King’s work, and actually the made for television format contributes to It’s success. Because it was made as a two-part mini-series, there is time to examine all of the main characters in some detail, so you get to know them and empathize with their fears. The made for television format also limits the amount of violence and gross special effects, so the teleplay relies more on suspense. scary situations, dialogue, and the flashback device to keep the viewer engaged. The teleplay by Lawrence D. Cohen and Tommy Lee Wallace does justice to Stepehn King’s book, which is one of his best horror stories. The adult cast is a who’s who of situation comedy and television series stars from the late eighties and early nineties (Harry Anderson, Dennis Christopher, Time Reid, John Ritter, Richard Thomas, Annette O’Toole, Richard Masur), and because their roles in this film offered a chance to stretch out and act in a different genre, each of them clearly put good effort into the production. The adult stars are ably complemented by their juvenile alter egos, led by by Jonathan Brandis. Tim Curry as the evil clown and Michael Cole as the town bully also deserve kudos for strong performances. Director Tommy Lee Wallace keeps the suspense building and the action moving, so you hardly are aware of the three hour time span it takes to watch It. As with most Stephen King long novels, the ending is never as satisfying as the suspense building up to it,, but let’s face it, as real as you try to make it, this is still fantasy. The pleasure you get comes from escaping the real world and entering this tale of horrors for a while. 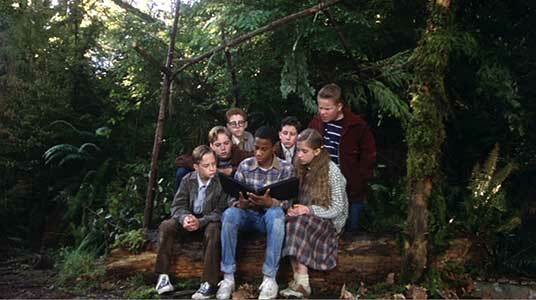 The seven kids examine Mike’s scrapbook with articles about strange happenings over the years in Derry. Belch is caught and stood up by the light force of the monster. 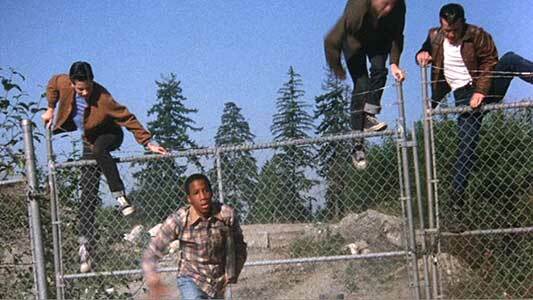 It is filled with characters wearing black high top chucks, including Ben, Bill, Richie, and Eddie of the seven heroes, along with Belch and several of the other town bullies. 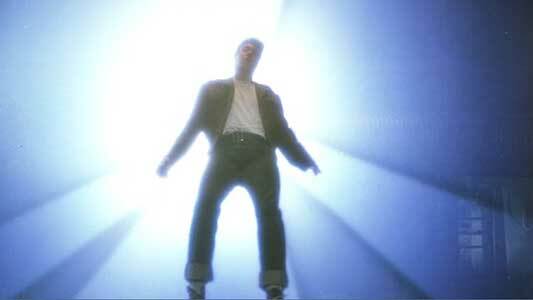 Additionally, we see Mike wearing low cut white chucks. 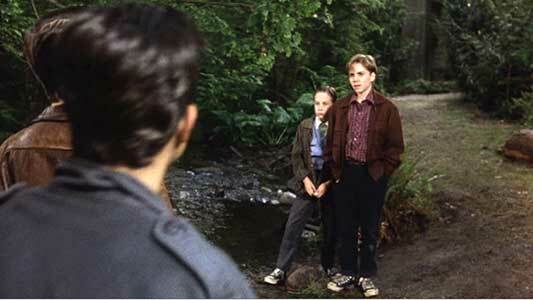 There are lots of good shots throughout all of the scenes set in 1960 involving the seven as 12 year old kids. 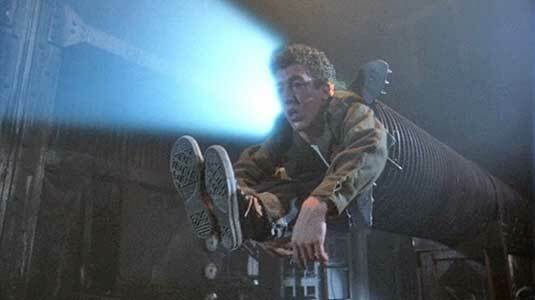 But the best chucks scene is when Belch is taken by the dead white light of “It” as it stands him up in its force field, and then you see him slowly pulled down a drainage pipe, with the soles of his chucks the last thing you see before he disappears. A very chilling scene. . .
Belch is slowly sucked down a pipe by the force of the monster. It. (1990) Harry Anderson, Dennis Christopher, Richard Masur, Annette O’Toole, Tim Reid, John Ritter, Richard Thomas, Tim Curry, Jonathan Brandis, Brandon Crane, Adam Faraizl, Seth Green, Ben Heller, Emily Perkins, Marlon Taylor, Drum Garrett. Directed by Tommy Lee Wallace. Categories: Drama, Horror, Crime and Mystery.